Learn more about these address/account types. Important: Only domain administrators can manage these types of accounts. Request account from your departmental IT administrator. If your department has a departmental Office 365 domain such as "@doit.wisc.edu", contact your domain administrator to request a new account or address. If you are unsure whether your department has an Office 365 domain, or who your domain administrator is, contact the DoIT Help Desk to find out. Description Provide details for use of this account. Linked NetID(s) These NetIDs will be granted Full Mailbox and Send As permissions over the service account, can access the account in Google Apps, and more. Learn more. Administrative Administrator NetID(s) These NetIDs will be granted administrative rights over the service account within Wisc Account Administration site. Learn more. Request an @mailplus.wisc.edu account. If your department does not have an Office 365 domain, you may request accounts in the generic "@mailplus.wisc.edu" domain. Follow these instructions to request a mailplus.wisc.edu Service Account, Alternate Address or Resource. Request a custom/vanity @wisc.edu alternate address. In some cases, it is possible to obtain a departmental address of the form "@wisc.edu" as an Alternate Address tied to a Service Account. See this document for requirements on these custom @wisc.edu addresses or to submit a request. Request a new domain to create accounts in. In some situations, none of the above options are satisfactory. 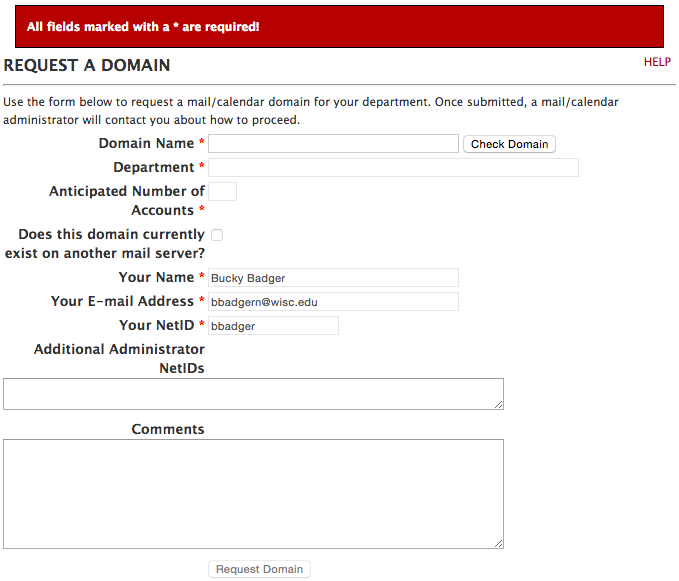 If you decide to submit a new domain request, it will require approval from the leadership of UW-Madison's Office 365 Team. All requests for new domains in Office 365 are subject to review and approval by the leadership of UW-Madison's Office 365 Team. Unlike accounts within the mailplus.wisc.edu domain, you will be responsible for administering all of the accounts within your domain. Microsoft has a limit on the number of sub-domains created within the wisc.edu environment. The more sub-domains that exist within wisc.edu, the more resources/infrastructure is required to manage it. Go to Wisc Account Administration Site. Enter the required data (including any special request within the comments field). A mail/calendar administrator will contact you within a couple of business days.